Annual Butterfly Count, Saturday, June 25, 8:00 am - 1:00 pm. Our Gray Catbirds are back. My wife noticed them first. We know they are “our” catbirds, because they made a beeline for the suet feeder. I like the way they look, the smooth gray with the black cap and button eyes, and they seem so comfortable being here. I’ve been seeing courtship behavior – begging and bill-touching - but not much singing yet (if you can call it singing - melody is not their forte.) That is in contrast to the House Wrens, whose exuberant songs seem to be all around. 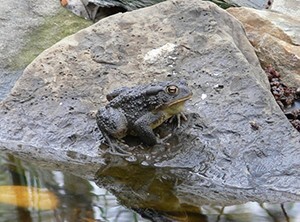 Alonso Abugattas has some encouraging news about amphibian populations in Arlington County which can be seen here. Another example showing that our native wildlife populations need not all be in a depressing decline – our conservation efforts can make a difference, and we can find ways to live alongside our wild neighbors, if we put our minds to it. Our Audubon at Home program is all about that, about making wildlife habitat in the places we live. Interested in learning more about it? Sign up for our Carol and Jay Hadlocks’ workshop “What is Audubon at Home, Anyway?” More information can be found here. Plan to join us for our next Audubon Afternoon. It will be on Sunday, June 12; it will feature a talk by Mike Lott on the Virginia Breeding Bird Atlas project. We’re also planning a follow up, hands-on “Survey Techniques” workshop on June 18. Space is limited for the workshop. And Birdathon is underway! If you haven’t organized your team yet, time’s a-wasting! Register a team here. Or – you can pledge your dollar support for your favorite team on our website here. The Second Virginia Breeding Bird Atlas (BBA2) is starting up this spring. This will be a multi-year, state-wide survey. Mike Lott is our Regional Coordinator for the BBA2 in Northern Virginia, and he will speak to us about the history and purpose of the Atlas. He will also be available to answer any questions you might have about how you can participate in this project. Click here for more information about BBA2. This meeting will also be our annual meeting for our Chapter membership. And we will also be announcing Birdathon winners! The National Parks BioBlitz and Biodiversity Festival. The 2016 BioBlitz is an amazing opportunity to explore, document, and help protect our wonderful national parks for the next 100 years. You can be part of this centennial celebration of the National Park Service and biodiversity in our parks. Spring is here, and Birdathon is on its way! It’s time to organize your teams and sign up for our annual spring migration birding competition. The concept is simple: Participants can bird in teams of two to five. Team members then make their own donations or secure pledges from friends, family members, colleagues, neighborhood merchants, etc. Then, during any 24-hour period between April 22 and May 15, teams search Northern Virginia to see how many bird species they can identify. As in the past, we will be awarding prizes to members of the team that raises the most money and to the team that identifies the most species. Click here for more information. Double-striped Thick-knee, Spangle-cheeked Tanager, Sooty-capped Chlorospingus, Black-billed Nightingale-Thrush, Montezuma Oropendola, and Scrub Euphonia! 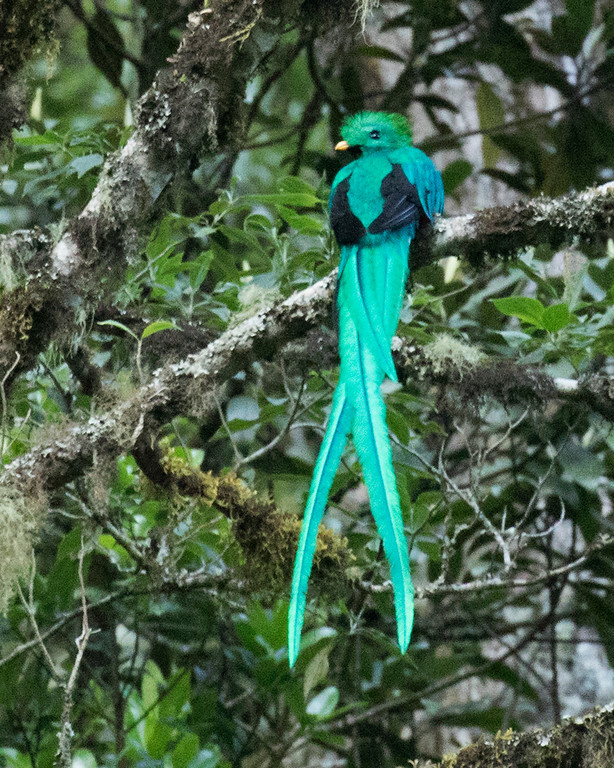 These strange sounding names from far away became living birds on an ASNV-sponsored tour of Costa Rica in March. From sea level on the Pacific Ocean Gulf of Nicoyo (Turquoise Motmot, Pacific Screech-Owl, Bare-throated Tiger-Heron) to an elevation of 11,300 feet in the Talamanca Mountains (Volcano Junco, Fiery-throated Hummingbird), our group of 12 sharp-eyed ASNV birders enjoyed a week exploring a small part of this Central American country, tallying over 200 species. What is Audubon at Home, Anyway? Are you curious about the program, not sure if you want to try it on your own but not quite ready to call for an Ambassador? This workshop explores the principles of Audubon at Home in a backyard, real-life setting. You will spend the day learning about gardening with native plants, composting, rain barrels, creating habitat for birds and pollinators. You will also receive lots of helpful reference materials to take home with you. Come spend some time outside, enjoy the beauty of this amazing backyard habitat and observe its many wildlife visitors—it will be a fun and informative day. Register Here. Additional photos of Carol's and Jay's back yard here. A five-year project to document the breeding birds of Virginia is being launched this spring: the Virginia Breeding Bird Atlas. Join us at Riverbend Park visitor center at 8 am Saturday June 18. We will be looking for breeding birds while you learn how to find and document evidence of breeding. 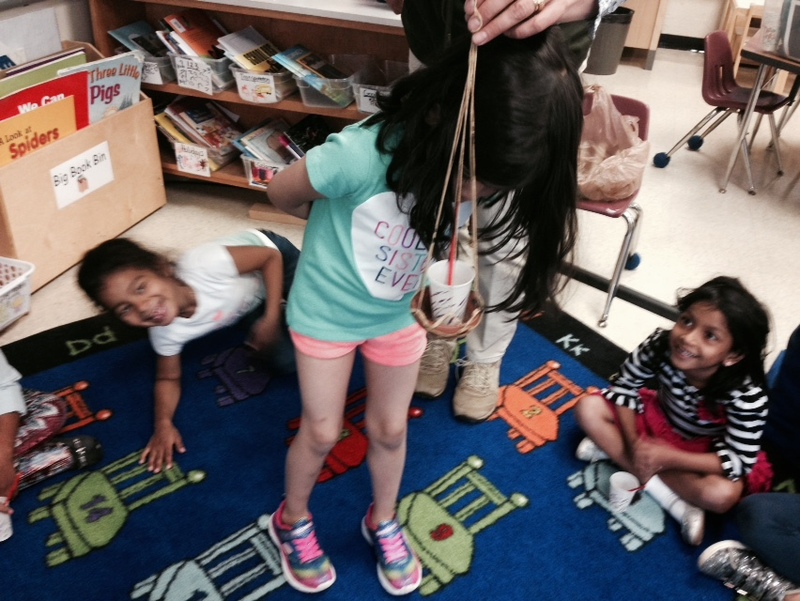 You can take what you learn and put to work anywhere in Virginia over the next five years. It's a lot more fun than regular birding and much more valuable for conservation. Leaders: Ashley Peele, Coordinator of the VABBA project, and Greg Butcher, ASNV Board Member. According to city statistics, Alexandria dumps 11.3 million gallons of raw sewage through four outfalls into the Potomac River every year through what is called a “combined sewer overflow” system. The city is preparing a long-range control plan and is accepting comments on the draft plan. Millions of bird die every year after colliding with buildings, especially windows. National Audubon urges all Auduboners to encourage their members of Congress to support H.R. 2280, the Federal Bird-Safe Buildings Act. Click here to learn the details. In addition to electing a U.S. president this year, Virginians will elect 11 members of the U.S. House of Representatives. Question the candidates, ask for their conservation platform, get involved in the campaign of your choice and make the case for conservation. Once again the Loudoun County Wildlife Conservancy is hosting a number of bird walks at different locations, including Bles Park, Algonkian Park, Banshee Reeks, and the Blue Ridge Center. No fee, but registration is required. Click here for more information. Riverbend is always a productive birding area. We’ll look for spring migrants in meadowland and wood edges. Ray Smith leads for ASNV. Getting there: Take Georgetown Pike (Rte 193) to Riverbend Road (Rte 603). In 2 miles turn right on Jeffery Road and go 1.5 miles to Nature Center parking area (Don’t turn right at main park entrance sign). 8700 Potomac Hills St, Great Falls, 22066. Stratton Woods has a mix of woods and meadow habitats, and we’ll be looking for spring migrants and evidence of nesting. Sponsored by the Bird Feeder of Reston and the Reston Association. This neighborhood park offers woods and stream habitat, with field edges that make good viewing opportunities. Sponsored by the Northern Virginia Bird Club. Leader is Elizabeth Fenton. Getting there: From Route 50 outside the beltway, take Prosperity Avenue South to the entrance to the parking lot on the left (east) side. As part of the National Park BioBlitz, Ed Eder and Larry Cartwright will lead walks in this waterside and woodland habitat for the Friends of Dyke Marsh. Getting there: From Alexandria, take GW Parkway south. Cross I-495; continue 1.2 miles to Belle Haven Park entrance on the left. Meet at the south parking lot. 6401 George Washington Memorial Parkway, Alexandria, 22307. 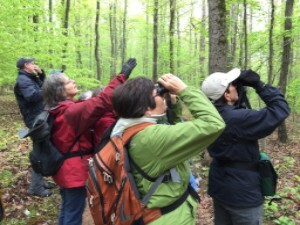 Join fellow birders at Thompson Wildlife Management Area at 7:30 AM on Sunday, May 22 to look for long-awaited spring woodland species including Cerulean Warbler, Scarlet Tanager, Veery and Rose-breasted Grosbeak and enjoy the wildflowers along the trillium trail. eBirders have recorded 100 species (including 24 warblers) along the Trillium Trail in May Trillium Trail May. After birding the Trillium Trail, enjoy great Virginia wines and your bag lunch at Fox Meadow Winery, conveniently located adjacent to Thompson. Each participant must have an access permit or a valid state hunting or freshwater fishing license issued by Department of Game and Inland Fisheries. You must obtain this in advance. Daily permits are $4.00. The yearly licenses are $23.00. For more information visit DGIF. You cannot get a permit at Thompson WMA. Fox Meadow Winery is located in Linden Virginia and they have been crafting great wines for a decade. They have wines for all tastes from their marvelously dry Cabernet Franc to their fun Blue Mountain Mist. Tastings (with some food pairings) are $12.00/person. You must be 21 or older to participate in this part of the outing. After the wine tasting, enjoy your picnic lunch and the view from the deck overlooking Fox Meadow’s vineyard. Bird Walk /Wine Tasting is limited to 15 participants. To register, contact Ellen Jacobson. Bring your permit, your lunch and $12 for the wine tasting. Sponsored by ASNV; Ellen Jacobson leads. Bring $12 to participate in wine tasting and bring your own picnic lunch. The wetlands boardwalk and the wooded paths provide a great place for birding. Come find migrants and year round residents. Sponsored by Northern Virginia Bird Club. Dixie Sommers leads. This is a section of the Glade Stream Valley that is rich in songbirds and often has a surprise or two. Carol and Jay Hadlock lead. Sponsored by the Bird Feeder of Reston and the Reston Association. Getting there: Take the Dulles Toll Road West, to Exit 13, Wiehle Ave. Turn left onto Wiehle, Right onto Sunrise Valley Drive, Left onto Soapstone Drive, and then Right onto Glade Drive. Meet in the parking lot of the Glade Swimming Pool and Tennis Courts. 11550 Glade Drive. Bluebirds, tanagers, and orioles, oh, my! Those are just a few of the species we often find on this early summer walk along woods edges and stream crossings. Sponsored by Audubon Society of Northern Virginia. Dixie Sommers leads. Join Larry Cartwright on his “home turf” of Dyke Marsh to look for summer breeding birds along the river and the woodland path. Sponsored by the Northern Virginia Bird Club. ASNV’s new Youth Education Committee has begun an effort to engage with clubs and groups that introduce children to nature through outdoor education. 4-H Clubs, which are grounded in the ideal that strong minds have strong values, work with children in the areas of agriculture and conservation.